"Cool site! 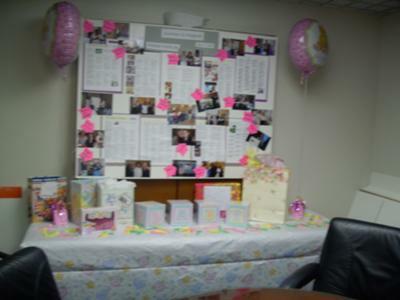 I used some of your ideas and had a wonderful baby shower. Thank you!" 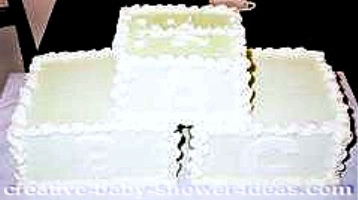 This baby blocks cake was made out of 10 inch cakes, 1-8inch layer cake and 6 inch cakes. I stacked them on top of each other and decorated it with fondant accents. I also made smaller matching block cakes to spell out the baby's name. 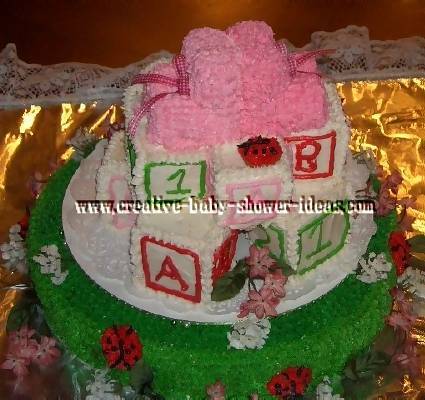 The decorations on the smaller cakes are also made out of fondant. We will be starting with the block. Step 1: Make 3 Square Layers of your choice cake mix. Step 3: Use Star tip for borders and letters. For the baby booties on top of the block. Step 2: Place a plop of frosting in front of the Dixie cup, and continue to decorate with star tip. Step 3: Using round tip make a bow for the booties. Add baby toys you can find at Walmart, or even the dollar store. Step 1: Using Wilton pan bake the cake. Step 2: Frost cake with star tip. 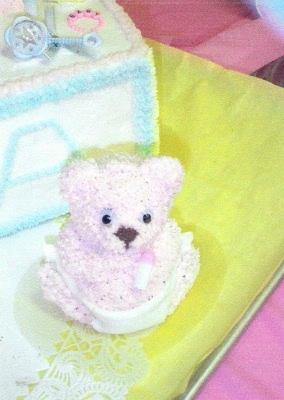 Step 3: Using fondant make a diaper, and place on bear. 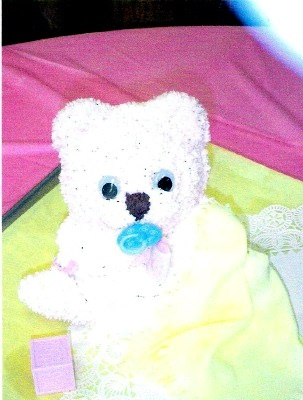 Step 4: Use wiggly eyes again you can find almost anywhere, and place onto bear. **I placed the cakes on a doily on a tray. 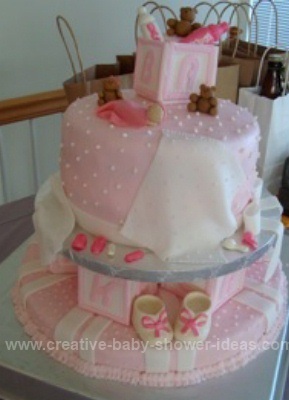 And there you have a fun baby shower cake!!! I used 2X6 inch cake pans and cookie cutters to make the outlines for the designs. I made the booties and flowers with fondant icing and laced the booties with sheer ribbon. The top cake is Chocolate, 2nd cake is Vanilla, and the third is Strawberry. I iced them with butter cream dream frosting. 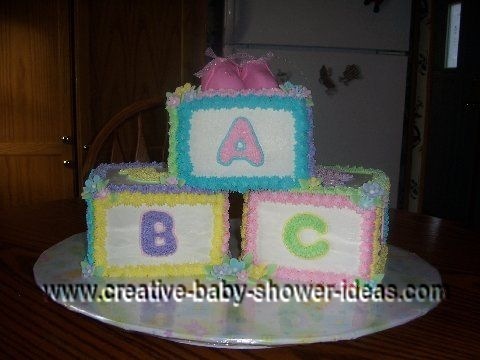 Mary sent in this adorable abc cake photo to share with us! To make the blocks, she used square pans that were 6 x 2 inches. The flavors of the cakes were chocolate, carrot, white and strawberry. A great tip she shared was to use cookie cutters to make the letters and designs. That makes it a lot easier to get accurate decorations! Cream the cream cheese, milk and vanilla in large bowl on low speed, until smooth. Slowly add in the powdered sugar, 1-cup at a time to get a smooth, spreadable consistancy. To make the adorable booties on top, take 3 large marshmallows. Cut one in half and stack it on one of the other marshmallows. Use your frosting to stick all the marshmallows together. Use a # 16 or # 18 open star tip for your frosting. To make a crocheted frosting look, start at the bottom of the two marshmallows and make a shell pattern going left to right, working your way up. Continue going up with the shell pattern, over the half marshmallow. Pipe around the half marshmallow in the same manner. Then on top of the foot of the bootie, pipe the shells in a top to bottom motion to give the crocheted look. The block cakes are made out of 3 -6" cakes iced in buttercream. Support the 3rd block on top with dowel rods and put your own accents on with fondant. I made 10" layer, 8" layer, and 6" layer. It is covered in fondant and all the decor was made with fondant using molds for candy. After baking your favorite pound cake recipe cut the pound cake into 4 blocks. Decorate with homemade buttercream frosting. Using a cake circle on you bottom 10in round frosted so the cake circle will stay put. Place the decorated blocks, stacking them carefully. The booties are made out of large marshmallows 2 for the bottom one for the top all attached together by toothpicks. Make bow and attach with decorative straight pin. Added hand made ladybugs and fake flowers to match new baby's room theme. The blocks are holding up the top layer of the cake. The blocks are made of fondant. The booties are made of chocolate and molded using baby chocolate molds. This was a baby shower cake for my sister who was having a boy. I matched the theme of the baby shower, which was Carter's Baby Boy. I covered all three tiers with fondant. I matched the colors, which were dark blue, sky blue, light blue, brown, and a light olive green to the Carter's shower decorations. The blocks were made of rice crispy treats and covered with fondant. The top tier had fondant stars that were shaped by using star shaped fondant cutters and I shaped the clouds myself. The stitches were drawn on with an edible marker. On the second tier, the train was made using a cookie cutter train set and then shaped them to look like the Carter's train. The stripes, polka dots, and wheels were made of fondant. On the bottom tier, the ribbon and each stripe was cut out of fondant. For the stitching, an embosser tool was used for the ribbon, stripes and the border of each tier. 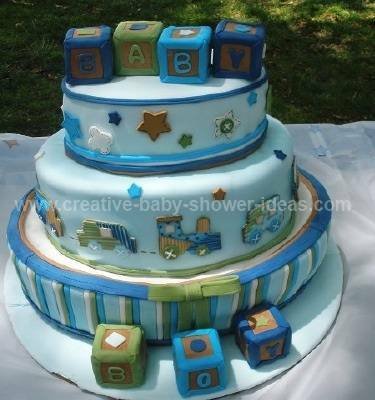 I was asked by my neighbors if I could make a baby shower cake for their baby boy. They didn't know exactly what they wanted so I just started thinking of some cute ideas. This worked out nicely because they were little cakes with icing and melted starbursts that I melted then shaped into letters. 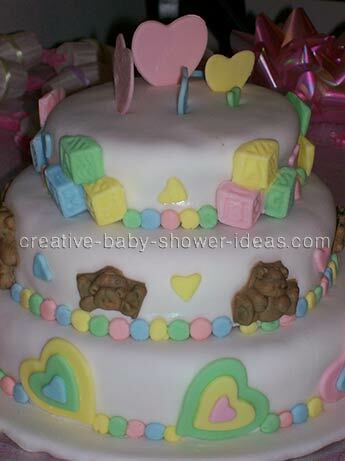 Then to finish it up I added colorful m&ms to make it look more colorful for the baby shower. They loved it! 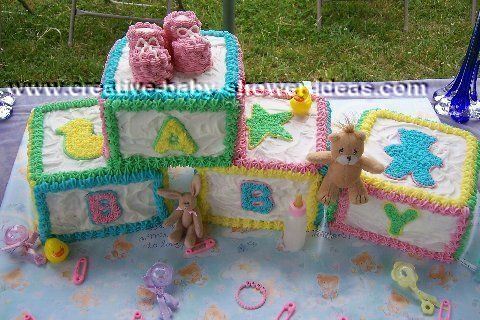 Robert S. - Mr. Fun from Cedar Grove, N.J.
My wife asked me to make a baby shower cake for the expecting grandmother. She gave me a paper plate from the party and this is what I came up with. 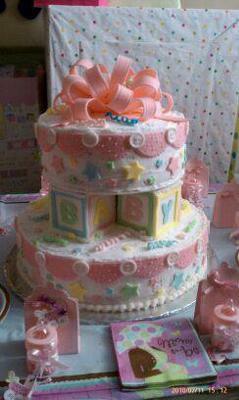 I made this cake for the baby shower of my first grandchild. 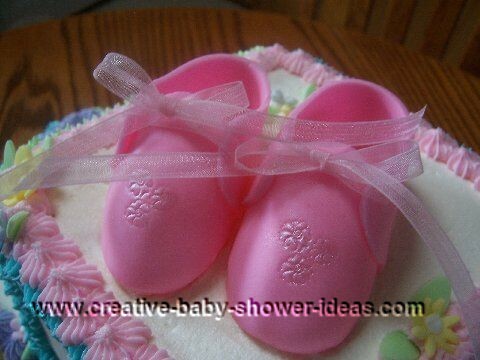 The pink booties, name and the circle they are sitting on are made with half fondant and half gum paste. I used edible glue to attach them. I covered a cardboard cake circle and put a piece of wax paper between cake and board so it can be removed and saved. The rest of the cake is all covered in butter cream frosting. The colors I used are light pink, peach, light purple, light green, yellow, ivory, and white. The base of the cake is an 11 X 14 vanilla cake. The 4 baby blocks are 2X2 chocolate cake. I used two 8X8 cake pans to make the blocks cut them to the proper size. The top of the blocks say BABY and the front of the blocks say GIRL. On the back and sides of the blocks I made pictures of bib, diaper pin, baby face and onesie.